In the automotive industry, sound plays a key role in creating emotions for drivers, car passengers and pedestrians – be it high fidelity in-cabin audio or the sound of a sporty engine. HARMAN is not only the leader in providing best-in-class car audio experience, but also a top supplier of active noise management solutions to OEMs globally. Through its HALOsonic suite of active noise management solutions, HARMAN helps OEMs provide an exhilarating driving experience through electronic sound synthesis, or offer a quieter in-cabin ambience by reducing engine and road noise. When it comes to active sound management for Electric Vehicles (EVs) and Hybrid Electric Vehicles (HEVs), HARMAN’s Electronic Sound Synthesis technologies (iESS and eESS) enable OEMs to design a sound befitting the cars’ brand DNA both inside and outside the car. 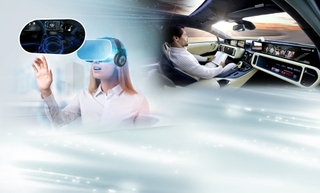 Along with HARMAN’s flexible Global Tuning Tool (GTT) and extendable audio framework, this technology gives OEM sound engineers flexible, comprehensive signal flow design capabilities to create smart audible pedestrian warning systems that comply with global regulations and help in designing advanced ”sound signatures” to render a powerful V6 engine or a futuristic electric car sound. HARMAN’s GTT also facilitates an incremental signal flow design and a seamless tuning approach, so that OEM sound designers can start the design and tuning process early in the development phase, right from the comfort of their development studios and laptops without necessarily having access to the target amplifier and/or target vehicle – ultimately aiding in the quick turnaround of tuned cars. 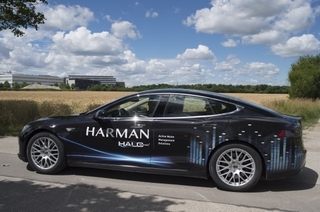 Recently, HARMAN displayed the full spectrum of electronic sound synthesis capabilities in a ride and drive demo to automotive OEMs and their industry partners. The interactive sessions provided valuable insights and feedback – a significant aspect helping HARMAN in its relentless pursuit to push boundaries and provide best-in-class solutions. Roadside sounds seeping into the cabin is a predominant contributor to in-cabin noise in EVs, which don’t have an IC engine that typically helps to mask road noise inside the cabin. 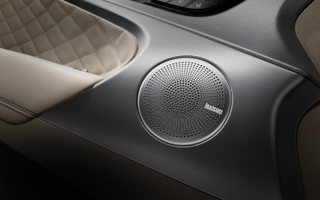 HARMAN has developed the Road Noise Cancellation system (RNC) which reduces road-induced noise levels inside the cabin. OEMs can utilize HARMAN’s RNC and ESS technologies to offer a multitude of experiences for EV end users – whether it is enjoying the relative peace offered by the EVs, by having only RNC switched ON and your favorite music playing through the HARMAN branded audio system or creating a driving experience that can sync with your mood by switching to a V6 sporty sound or even a Star Wars drone sound. Moreover, our features such as over-the-air updates help OEMs to push various sets of sound synthesis tuning files and address customer specific needs. 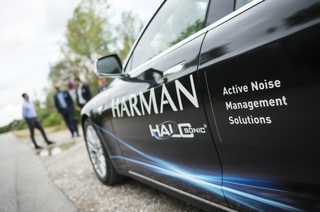 With the help of our global HALOsonic team, HARMAN is excited to work with OEMs and render a “signature voice” to EVs through the deployment of active noise management technologies and design tools. *Advised to be watched using headphones for best audio performance.